Academicians at an inaugural function on Friday laid emphasis on skill development of the officials concerned to ensure efficient institutional management of funds, expenditure and other related financial matters. "Financial management is an important for university officials to ensure best use of funds and bring dynamism in administrative activities," said Vice-chancellor (VC) of Begum Rokeya University (BRU), Rangpur Prof Dr Nazmul Ahsan Kalimullah. 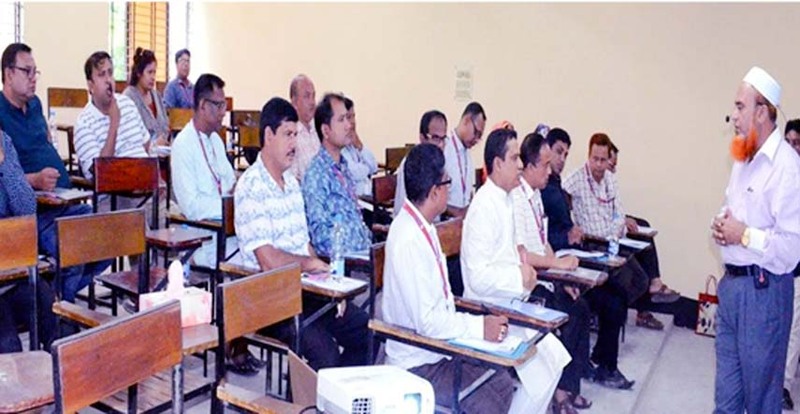 Kalimullah was addressing the inaugural function of a two-day training programme on "Financial Management of University Officials" held at Kobi Heyat Mamud Bhaban of the university as the chief guest. The BRU unit of Institutional Quality Assurance Cell (IQAC) is organizing the event being participated by Additional Deputy Directors, Deputy Directors, Deputy Registrars, Assistant Registrars and officials of all offices, divisions, departments and sections of the university. Dean of the Faculty of Arts Prof Dr Parimal Chandra Barman and Dean of the Faculty of Science and President of Begum Rokeya University Teachers' Association Prof Dr Gazi Mazharul Anwar addressed as special guests. Registrar of BRUR and former Financial Director of the University Grants Commission Muhammad Ibrahim Kabeer is conducting the training as main resource person. The resource person discussed details on budgets, finance and accounting, pension, daily finances and office management, information on getting desired development budget allocations through systematical ways and its proper implementation. Prof Anwar said there is no alternative to expertising the skilled manpower for protecting the institutional image. Prof Barman hoped that the training programme would improve skill and expertise of the participants and assist them in conducting financial activities with more efficiency in future.